Call out "Feng-shui" at any lively cocktail party and you will immediately rustle up the attention of all the professional (and wannabe) decorators in the room. They will tell you about beautiful coffee table books featuring color prints of pricey organic furnishings and explain how a mirror placed here and a bamboo plant there can reroute the bad vibes in even a hovel and pave the way for the good ones to flow in. But if you really want to understand the fascinating subject of Feng-shui, you may want to read FENG-SHUI: THE SCIENCE OF SACRED LANDSCAPE IN OLD CHINA, a small gem which, though written well over one-hundred years ago (by a rather unlikely observer) remains the best classical treatise on the subject available. In fact, most of what we know about the history of feng-shui comes from Ernest J. Eitel, a nineteenth-century German Protestant missionary to China who studied and wrote about "Buddhism in China" as well. 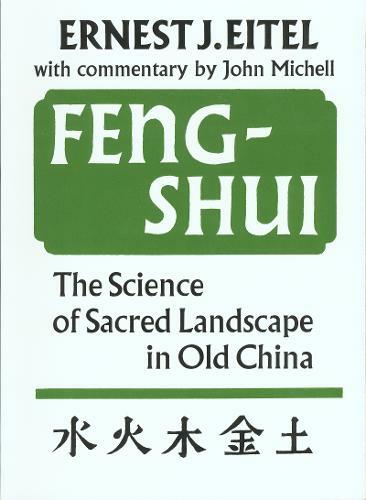 FENG-SHUI: THE SCIENCE OF SACRED LANDSCAPE IN OLD CHINA was first published in 1873. Because it offers a unique perspective on a subject that has since been seriously commercialized (and bastardized) in the west, we at Synergetic Press kicked off our publishing program with a reissue of this much-cherished title in 1984.